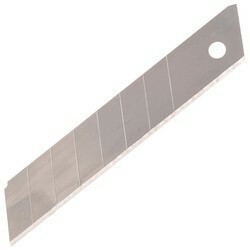 We are a leader in offering best quality Snap Off Blade. In order to keep pace with never ending demands of customers, our company offers excellent quality array of Snap Off Blade Cutter. This Snap Off Blade Cutter is available in different sizes, dimensions and specifications as per the client’s requirements. Our product range has easy to replace blade. - Bi-Metal snap blades are produced through a patented process of combining two types of metal, spring steel and high speed steel. - Spring Steel allows the blade to bend without accidentally breaking. It also ensures that the blade snaps cleanly on the score every time. - High-Speed Steel Delivers a hardened cutting edge that stays sharp 3x longer than traditional carbon blades. - Body made out of High Quality ABS Material. - Sleek Design makes it easy to use. As a recognized name in the industry, we are offering an exclusive array of Snap Off Blade Cutter. The offered cutter is manufactured using high quality raw material and modern technology in observance with the set international norms. Our quality controllers check this cutter on various quality parameters to avoid any flaws. With genuine intention to preserve and uplift our standing, we are providing a premium quality of Snap Off Blade to the market. We are a reputed entity, engaged in offering a qualitative array of 9mm Snap Off Polo Cutter.